We love telling others that we are co-principals because it is usually met with a series of questions. What is that? How does that work? How do you split responsibilities? Who’s really in charge? Do the kids try to play you against each other? Do the teachers? That’s when we answer like this: It works great. We don’t split anything. We do everything together. We share our leadership. The kids now mix up our names because they know they are going to get the same answer from both of us. The teachers love it-and no they don’t try to play us against each other because they know we share everything with each other. Telling one of us something is like telling both of us. We have a high degree of professional and personal trust between us and that makes our work successful. And I believe it is true. My first principalship, as was Michael’s was a solo experience. We became collaborative partners and began presenting at conferences, founded the first EdcampSC (South Carolina, and worked on numerous projects together. It was in that experience that we found how much our work together was helping us survive the principalship. As two new, and then young, principals, we found ourselves sharing the challenges we faced in our individual schools (we worked in the same district, but not in the same school previously), and began relying on each other to offer a shoulder of support or view/perspective other than our own. Finding time for this was usually over the telephone on the way home from work, or a quick phone call or text message during the school day. As our professional partnership grew stronger, we craved an opportunity to work together. The educational rhetoric around teacher collaboration is strong. Whether we are referencing the research regarding professional learning communities, co-teaching with special and regular education teachers, or simply the strengths of collaborative work design, we continue to emphasize that teaching is not at its best when it is treated as an act of isolation. As principals, we are taught to push our teachers to collaborate, but what about us? We take a complex problem of educating the masses and associate the success of such with finding a singular person who can lead. Contradictory? Just a little I think. Despite all the research regarding the challenges related to principal longevity and the stress of the principalship, we remain in the box. In a twitter chat this morning, #leadupchat (It was #leadupchathack today because you just can’t stop a mass of lead leaners! ), we talked about revolutionizing education. This immediately pushed us to think about revolutionizing educational leadership. If collaboration is good for teachers & must be embedded into the school day, why wouldn’t it be grand for principals? The principalship is stressful, emotionally taxing, and lonely. A coprincipalship creates a voice outside of your own head. Principals need partners. We can say without a doubt that our coprincipalship has extended our leadership endurance. If we want to continue to burn out great lead leaners, keeping the principalship as a solo endeavor is a guaranteed way to do so. Isolation is the enemy. It is the enemy to great teaching as well as the enemy to great leadership. Together, we are better leaders and better learners. In one year, our leadership abilities have grown in ways that could not have happened in a solo experience. The co-principalship needs to be scaled up and used-especially in high needs schools. It’s been an amazing experience for us and we have learned so much about ourselves and each other. It’s not just about emotional support either. It’s important to note that there is an intellectual stimulation that occurs as a result of our coprincipalship that just didn’t happen when we were solo principals. We challenge each others thinking. We have both grown stronger in our ability to look at a situation from a perspective other than our own. We are able to give ideas we may have never thought of on our own consideration, and many times bring them to implementation in ways that would not have been if we were not coprincipals. The demands of the principalship can be overwhelming. What we expect a single person to do for a dynamic and complex group of folks (teachers, students, parents, community members) may not be realistic. Being a great principal hasn’t necessarily been about heroic individual leadership in the past. It’s always been about collaborating and leveraging the strengths of everyone in the organization while working with key stake holders to create a quality educational experience for every child. Why we attribute that task to one person is beyond me? 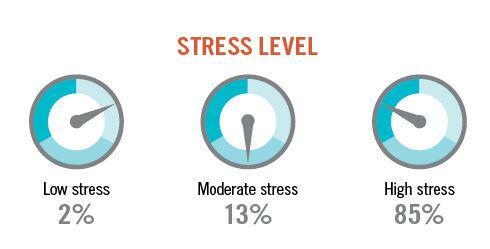 No wonder 85% of principals are highly stressed. No surprise to us. We could not be more proud of the work we have done together. The co-principalship has increased our leadership longevity, reduced our stress level, and increased our leadership abilities and perspectives. We want to share our experience with everyone who wants to listen. If you want to hear more from us, please continue to read our blog or contact us via Twitter at @latoyadixon5 and @mwaiksnis. We’d love to share our journey with you!